Does the Big West ever produce a season that isn’t entertaining with a tight race for first-place? Last year was no different, as UC Santa Barbara and Pacific finished in a tie at the top of the standings, with both teams going 12-4. By virtue of UCSB sweeping Pacific, the Gauchos got the first seed in the conference tournament. After those two, there was a drop off to spots three through five, as Long Beach State, Cal State Fullerton and UC Davis each finished 8-8. In the conference tournament, UCSB defeated Long Beach State in the title game – might we see a rematch for a championship this season? Ohio State defeated UCSB in the first round, but the Gauchos are looking to win a game this season. 1. 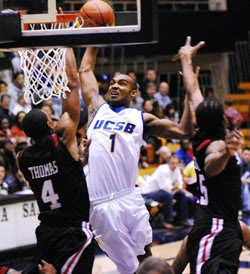 UC Santa Barbara: Look out for this team in the NCAA Tournament. The Gauchos return five starters from last year’s team, including Orlando Johnson and James Nunnally. 2. Long Beach State: The 49ers have plenty of talent; they just need to play to their potential. T.J. Robinson is a double-double monster, and Larry Anderson is athletic. 3. Pacific: The Tigers are always in the mix for a conference title, and this year will be no different. Sam Willard and Demetrece Young form a solid inside-outside tandem. 4. UC Davis: When a team can throw match-up problems Mark Payne and Joe Harden out there, they can’t be counted out. Payne’s health is a big factor. 5. Cal Poly: There is plenty of excitement in San Luis Obispo due to the arrival of Amaurys Fermin and the return of three double-figure scorers. 6. UC Irvine: If Maxime Chupin is cleared to play, this team could move up. As it stands, Darren Moore and Eric Wise are a formidable inside-outside combo. 7. Cal State Fullerton: The Titans will revolve around all-conference candidate Jer’Vaughn Johnson, but need a host of newcomers to contribute. 8. Cal State Northridge: Lenny Daniel is the team’s lone returning double-figure scorers, but a return to healthy by Rashaun McLemore could make a difference. 9. UC Riverside: The Highlanders finished last in the conference a year ago, and only one player who saw minutes last season returns. This is a rebuilding job. Payne and Harden can take Davis all the way the win the Big West Championship if they can both stay injury free. Mark my words.